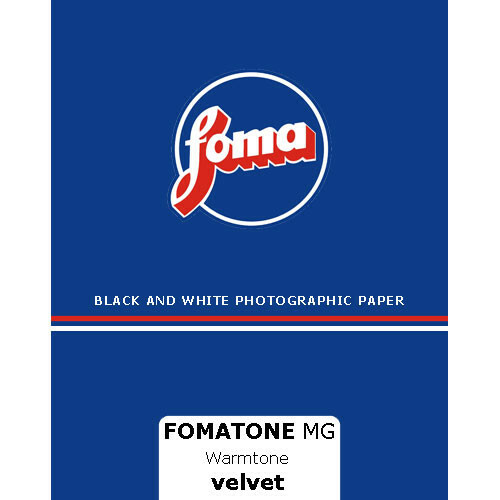 Fomatone MG Fiber RC Paper is a photographic paper with variable contrast in warm tone that is particularly suitable for the portrait photography and for working in s. c. retro style. Fomatone is made using a special silver chlorobromide emulsion that gives a silver image tone shading from brown-green to warm brown that can be influenced using various types of developers. The paper base on which the paper is made is colored in compliance with the tone of the developed silver and this accentuates a rich scale of warm halftones shading from light cream to a saturated brown-(green)-black. Because of a lowered speed the paper is mainly suitable for contact works, but it can be used as enlarging paper as well. The contrast of Fomatone MG can be varied in a large grade scale from extra soft to hard using color filters. This paper is made according to an old Neobrom recipe from Czech Brno. Very nice for landscapes, body landscapes, portraits or prints that are supposed to look nostalgic. Also an excellent MLD/Lith Paper (bright red mid tones and lights). For obtaining warmer tones of the developed silver shorter developing times are recommended, the best ones are up to three minutes in dependence on the type of developer. It is important to stop the developing process before fixing and to follow the recommended processing; any deviation could cause heterogeneity of the gray areas on the print. For expressing the image tone other special developers for warm tone are recommended such as Agfa Neutol WA, Tetenal Neutral type Liquid and others. Box Dimensions (LxWxH) 14.016 x 0.394 x 0.12"